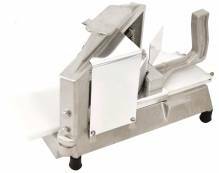 Use a tomato slicer to decrease your prep time dedicated to slicing a large amount of fresh tomatoes for your deli, grocery store, restaurant, and more! With the consistent size of slice, your establishment will cut down on waste, and unwanted sized slices. While a mandolin slicer is a good instrument to slice firmer vegetables, tomatoes require a more dedicated cut, and less handling to preserve its freshness. Make perfect tomato slices for your sandwiches, salads, burgers, pizzas, and more! Save time on everyday prep, and stock up your prep table with perfect and professional tomato slices!